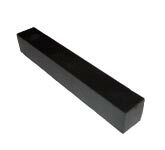 Sunray’s versatile Polyurethane Bars are the ideal solution for your immediate needs. Our resilient and strong polyurethane bars can be used in a variety of applications and are available in an assortment of Durometers, such as: 60A, 70A, 80A, 90A & 95A, and many more! They come in a variety of colors and are custom-cast to your specifications. Please allow up to 10 business days for your order to be processed. Click on the size to order!